Description: Prefetch files are used in the Windows Operating system to optimize the loading time of a Windows application on subsequent runs. These files contain information about the files loaded by the application. Prefetch Parser outputs the content of a prefetch file. By using this application, you can get a better understanding on what has executed on your machine. Date and time the prefetch file was created. Date and time the prefetch file was last modified. Number of times the referenced file was executed. Embeded date and time stamp for the file. List of files and directories to be loaded when the file is executed. 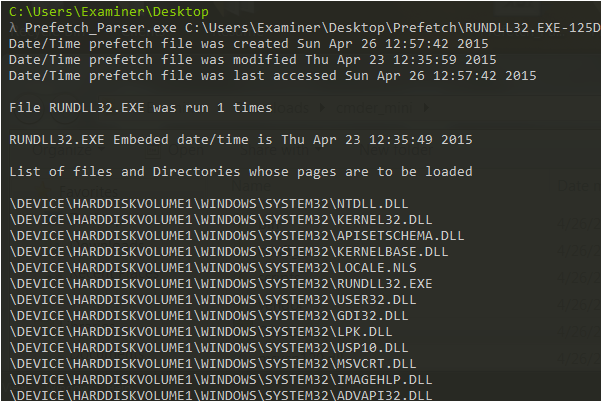 ::Prefetch.exe parses each prefetch file and gathers dates/file paths.